Cycling and walking are viable alternatives to the use of private cars or public transport, and are completely emission free forms of getting from 'A' to 'B'. They are, in fact, as yet the only readily available modes of transport that produce absolutely no emissions other than, arguably, biodiesel. When you consider, additionally, the very low cost of walking and cycling and the health benefits, there really is every incentive for the environmentally aware individual to maximise the use of both in their everyday routine. With nearly half of all trips less than two miles, walking and cycling can easily account for 50% of all journeys made by reasonably healthy people. With 25% of all harmful fuel emissions being produced by road vehicles, the environmental impact in electing to walk or cycle rather than drive or take buses could be huge. Walking has the obvious benefit of requiring no special equipment. It is safe, cost free and simple. It also adds to a sense of community, as individuals come into greater contact with each other when taking a stroll to the shops (for example) rather than a drive. For the environmentally aware, the simple pleasure of being able to look around, at parks, buildings rural and town centres is of obvious benefit, and can considerably contribute to personal well-being. Cycling requires the use of a cycle as is relatively more dangerous than walking. However, with government initiatives to increase cycle lanes in full sway, and providing you are sensible and aware, cycling can be a viable transport option. Cycling can be used for journeys of up t several miles or more and where you do not have heavy goods to transport, it is, environmentally, the best option after car travel for journeys over 2-3 miles. 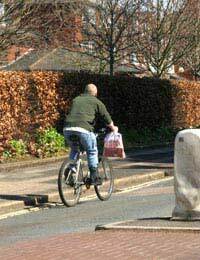 Walk to the shops: Where possible try to shop locally, and buy locally produced food on foot, or by cycle. Shopping for local produce has benefits in itself, because it discourages the mass transport of goods by carbon-emitting vehicles. Walk or cycle for leisure: Take long walks or bike rides as an activity in themselves. This is an inexpensive way of sightseeing. Walk to work: Where possible, walk or cycle to work. Some councils run grant schemes to encourage people to purchase bikes for work purposes. Commuting takes a huge toll on the environment. Walking to work is a good way to collect your thoughts and get your mind and body 'kicking started' before facing the day ahead. If you live too far away to cycle or walk to work, it worth considering moving, or finally, taking public transport. Take walking and cycling holidays in the U.K: Rather than flying abroad (which consumes huge amounts of carbon), consider taking a hiking or cycling holiday in the U.K. The government openly promotes walking and cycling as sustainable, healthy alternatives to using forms of transport that produce harmful carbon emissions: As 96% of citizens can walk and 75% can ride a bike this is seen as vital to a workable sustainable transport policy. Both the National Cycling Policy (1996) and National Transport Policy (2000) support initiatives to design roads and town centres to make walking and cycling more attractive, whilst providing grants for local councils to achieve this. The national cycling policy committed the government to double the amount of cycling by 2002 and double it again by 2012. Whether this has been entirely successful is hard to gauge, although cycling has seen a large increase in cities, due to continuing satisfaction with public transport performance and safety. Walking and Cycling are two of the easiest ways to contribute to a sustainable environment and ways in which you can partake immediately. It is worth drawing a plan around your regular routine. Divide a piece of paper into two down the middle. On the left, write the heading 'Now', on the right, the heading 'Next Week.' Following this, write down how all of your journeys are made now, and how you might better make them next week. If you implement his plan you will quickly notice an improvement in your health and lifestyle, as well as the longer term benefits for the local and worldwide environment.